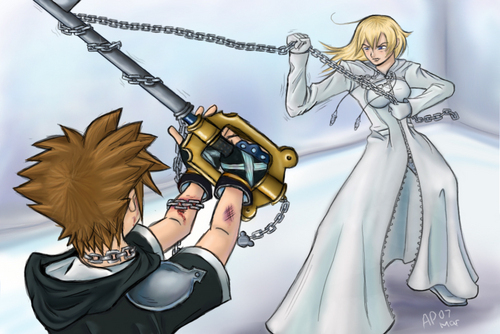 Naminé VS Sora. . HD Wallpaper and background images in the কিংডম হার্টস্‌ club tagged: kingdom hearts sora kh2 kh namine. This কিংডম হার্টস্‌ fan art might contain নকল মানুষের, কমিক বই, কমিকস, and কার্টুন. DANG!!!! what did Roxas do this time..LOL!!! I LOVE roxas and namine!!! Namine: I am gonna kill you before kairi! Namine: Well no cuz kairi kissed roxas and if i tried to kill her while you were alive you would kill me! i want a suit like namine's... anyways, the quiet girls are the strong ones. 1: WHY THE CRAP IS SORA LOSING!?!?!?!? 2: Namine Finally looks cute in a picture. damit y is SORA LOSEING!!!!!!!!!!!! lol why is sora all cut and bruised and namine doesn't even have a scratch? Go, girl! Show that Keyblader who's boss!! if she was able to be on ur team in the game she may use whips or chains and anyone like the zemnas cloak at the end where its black and white???? Sora:who are you??? Namine:your worst nightmare so im gonna kill you!!! Sora:=O OMG why? Namine:just because i want to so be quiet and ill make this quick...... 2 gruesome hours later...Sora:XP *blood on floor* sora never mess with namine and it wouldnt have happened i wish you didnt die waaaaaaaa!